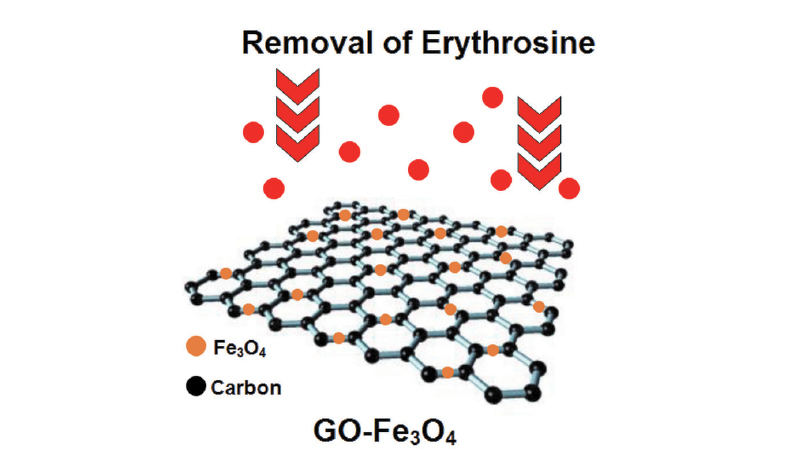 In this research, first graphene oxide (GO) was synthesized using modified Hummers method and thence via a multi-step procedure, surface of GO was decorated with Fe3O4 nanoparticles (GO-Fe3O4). Thereafter, developed nanoparticles were characterized using FTIR, XRD and SEM analyses and their magnetic properties confirmed using VSM analysis. Moreover, performance of the GO-Fe3O4 for the removal and adsorption of Erythrosine dye from the aqueous solution under variable conditions including pH, phosphate buffer solution (PBS), adsorbent content, stirring time, electrolyte concentration, solution content and temperature were examined. In this regard, for obtained solutions from the chicken slaughterhouse and hospital sewage disposal system containing 20, 50 and 70 mg mL-1 Erythrosine dye, GO-Fe3O4 nanoparticles adsorbed from approximately 94 % to 97 % of the total dye, respectively. What is more, the highest adsorption capacity was obtained at 149.25 mg/g by means of Langmuir model. The obtained results clearly showed that GO-Fe3O4 nanoparticles present a fabulous performance for the absorption and removal of dyes form disposal systems. Adsorption; Dye removal rate; Erythrosine; Graphene oxide; Iron oxide.